SEOUL, Nov. 12 (Yonhap) — K-pop boy group EXO has achieved a major milestone in the Korean music industry with more than 10 million cumulative album sales, its agency said Monday. SM Entertainment said more than 12 million copies of the group’s albums — five full-length albums, two EPs, a winter special album and a live album — have been sold since its 2012 debut. Among K-pop artists who debuted after 2000, EXO is the only one who has achieved the record, the agency said. All five of its LPs have sold at least 1 million copies. 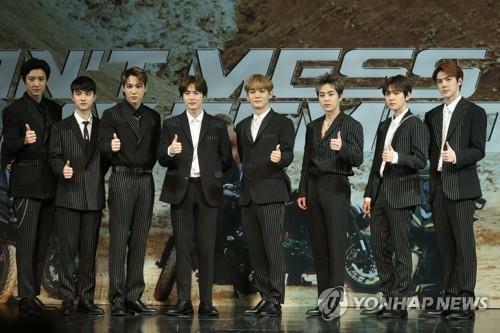 The latest one, “Don’t Mess Up My Tempo,” released on Nov. 2, has sold 1.17 million copies as of Sunday. The album topped iTunes’ albums chart in 47 countries and China’s Xiami Music’s overall chart.